I'm using arkit 2 with unity 2018 and arkit 2 beta branch from bitbucket. I successfully got the image tracking scene working when deployed on my iPhone X, however when using remote connection to speedup workflow, the image is not tracked. Any one experienced this issue before? Thank you. Problem with listing on Daydream Store After a week of having my app on the Daydream store it has been removed from the New & Updated section even though all the older apps are there, it appears just mine has disappeared. It is still available in the store for download when searched, I have not received any crash complaints or the like so I'm wondering why my app has been removed without notification. Does anyone have a contact email to the Daydream store crew? Using postprocessing on AR without affecting background Camera? Hi Can i apply postprocessing effects only on meshes but keeping intact the background camera? Thanks. Post Processing Stack v2 not working in VR? 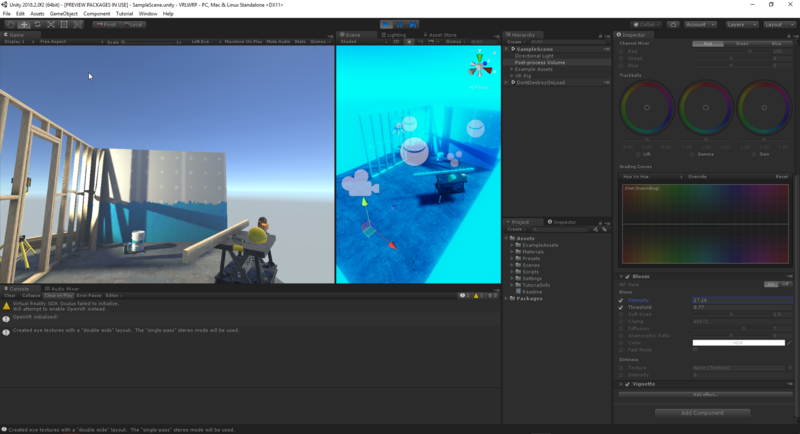 I'm using the VR LWRP Template that came with the Unity Hub in 2018.2. Wasn't this supposed to work. Why else would they include the post effects in the VR template?! i'm very new to unity, but i have an actual problem where i need a shader that is not visible but conceal objects behind this concealer object. I come from the blender world and there is a so called holdout shader that renders the object which it is attached to and everything behind it transparent. In unity i don't even know what to search for. maybe the gif helps to understand it. I'm trying update to Vuforia 7.2 but when is instalating requires a destination folder and after appears a pop-up writen "Failed to locate Unity.exe". I read about select the folder program files/unity but doesn't works and don't exist many informations beyond that. I hope you guys can help me. Thanks! Camera facing billboards for VR Camera facing particle billboards for VR. Has anyone managed to stop the rotation of them when rotating heads. The particles look horrible in VR as they rotate when the head rotates. Has anyone been able to reduce the effect of this? I've tried setting Billboard Alignment to facing. I 've been trying to debug this thing for a day and a half and I cant wrap my head around it. It all revolves around the new 2018.2 Remoting feature. From my understanding it should be available for UWP (https://docs.microsoft.com/en-us/uwp/api/windows.storage) and there are multiple resources indicating that it's available when building for Hololens.